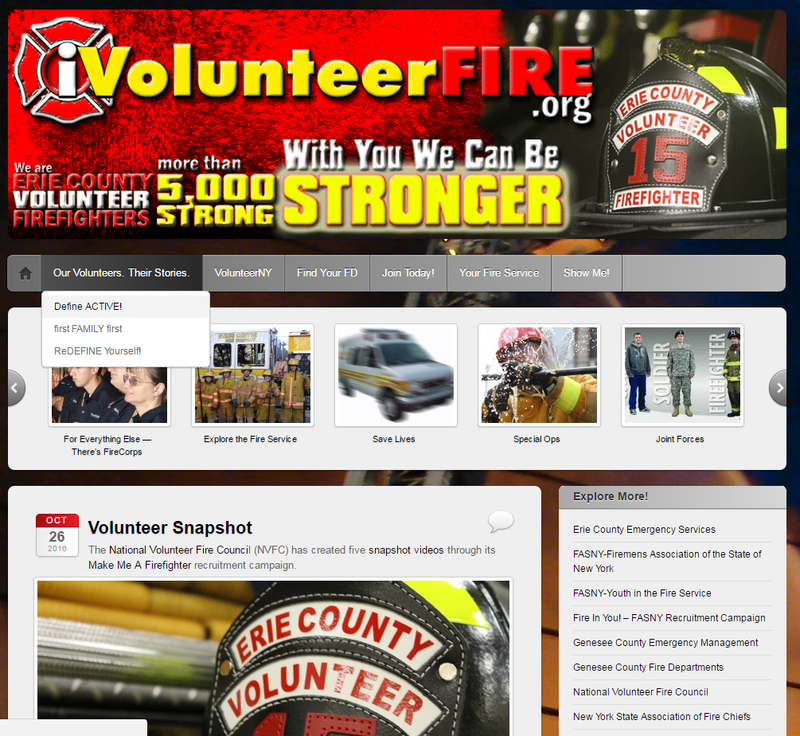 Erie County Volunteer Firefighters | Fight Fires | Save Lives | Volunteer Today! Fight Fires | Save Lives | Volunteer Today! Get FIRED Up Genesee County! We’re constantly looking to bring our call for volunteers to the forefront of our community so we’ve been busy creating some new promotional videos for our county’s 94 volunteer fire departments. We hope you like them and Respond! There’s a big difference between virtual and reality. Get REAL: Fight fires. Save lives. Volunteer Today! At first, 19-year-old Aidan Vangelov was hesitant to join the East Amherst Volunteer Fire Department because of the time commitment he thought it took, but in December 2016 he caught “the bug” of the love for helping people right away. Although he doesn’t have any family who have served in the fire service, he was strongly influenced by his father Dave who has worked in the fire industry for most of his career. Once he made the decision to get involved he realized just how enjoyable serving others can be. Aidan just graduated from Erie County’s Firefighter 1 Boot Camp training program on July 21, 2017 with 17 other volunteer firefighters from across the county. The course was delivered in a blended-learning environment where the students first attended a weekend orientation in May and then completed online coursework until they came back together for another weekend in June. That was followed by more online learning before attending the two-week Boot Camp conducted Monday-Friday for the two weeks in July and required 6-9 hours of intensive hands-on training and skills testing each day . 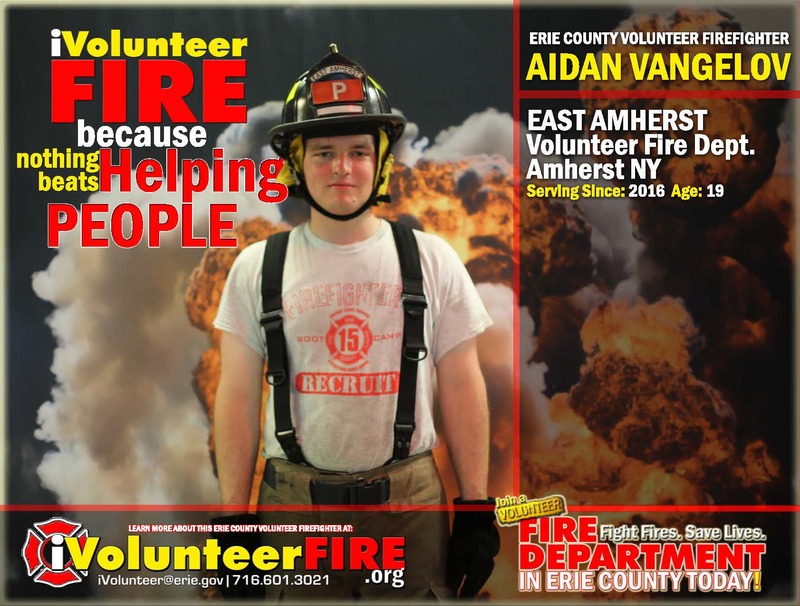 If you or someone you know are interested in joining Aidan and the more than 6,000 volunteer firefighters in Erie County, sign up today and we’ll connect you with the appropriate agency in your community. Line Up Now to Serve Your Community! As part of FASNY’s annual RecruitNY program, twenty-five Erie County Volunteer Fire Departments will open their doors to the community and prospective volunteers Saturday-April 29 and/or Sunday-April 30. Several of the participating fire companies are offering no-obligation “Firefighter Try-Out” programs that allow interested parties to test drive the opportunity to do some of the tasks and activities that volunteer firefighters and first responders do. Here’s a list of participating agencies as of 4/19/17. Find one in your neighborhood and line up to serve your community! Click here for a complete list of Erie County Volunteer Fire Departments and Emergency Squads and join today! Akron Fire Company 1 Main St.
Big Tree Fire Company 4112 Big Tree Rd. East Aurora Volunteer Fire Department 33 Center St.
Springville Volunter Fire Department 405 W. Main St.
West Falls Fire Company 1864 Davis Rd. From Erie County’s more than 5,000 Volunteer Firefighters: “Have a Safe and Happy Holiday” and please consider joining your local volunteer fire department in the New Year. Thanks to our media partners WBBZ-TV for producing thisa :30 second ad spot that includes a friendly holiday greeting, important safety messages and a call to volunteer. Say Thanks. Join Our Ranks! As if saving lives and running into burning buildings isn’t extraordinary enough, our communities benefit from thousands of extraordinary volunteers who give their time and energy – their lives to do just that every day. Published thirteen years ago, a 2003 FASNY study indicated that Erie County’s 94 volunteer fire departments save our taxpayers $203 million dollars each year. ReDEFINE Yourself! celebrates our county’s growing number of fire service Triple-F volunteers: Fabulous Female Firefighters. firstFAMILYfirst highlights the benefits of joining what we affectionately call our ‘second family’, especially when you’re already ‘firstFAMILYfirst’! DEFINE: Active! showcases our seemingly super-human volunteers who juggle home, work, family and a laundry list of volunteering activities in their REALLY active lifestyles! All three campaigns can be found under the “Our Volunteers. Their Stories.” menu tab. So, check out our super volunteers, take the time to say thanks and consider joining our ranks: Fight Fires. Save Lives. Volunteer TODAY!